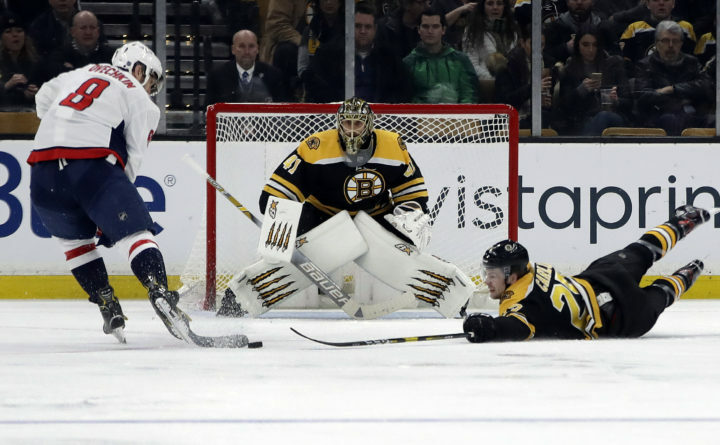 Boston Bruins defenseman Brandon Carlo, right, dives to prevent Washington Capitals left wing Alex Ovechkin (8) from scoring as Bruins goaltender Jaroslav Halak (41) protects the net during the second period of an NHL hockey game Thursday, Jan. 10, 2019, in Boston. Nicklas Backstrom is a believer in puck luck, something the Capitals have had plenty of against the Bruins in recent years. Backstrom, who sat out Wednesday’s game against Philadelphia with an illness, glided in to the Bruins’ zone and ripped a left-circle wrister past Jaroslav Halak for the go-ahead goal with 14:14 remaining. Alexander Ovechkin netted his NHL-leading 31st and 32nd goals of the season, and also had the highlight hit of the game when he sent Zdeno Chara — the NHL’s tallest player ever at 6-foot-9 — flipping head over heels into the Capitals’ bench on a shove late in the first period. Ryan Donato and David Krejci each had goals for Boston. The Bruins suffered a season-opening 7-0 blowout loss at Washington on Oct. 3 when the Capitals celebrated last season’s Stanley Cup title. Washington led 1-0 after the first period despite being outshot 17-5. T.J. Oshie grabbed a giveaway by the Bruins and flipped the puck from the Capitals’ end to a wide-open Vrana, who beat Halak with 13:22 to play. Tensions boiled over in the second when Washington’s Lars Eller and Boston’s Brad Marchand got tangled up during a play. Eller, whose celebration in front of the Boston bench after scoring the Capitals’ seventh goal in the opener drew postgame criticism from Marchand, was sent to the penalty box for unsportsmanlike conduct. NOTES: Bruins D Charlie McAvoy missed his seventh straight game with a foot infection. He participated fully in Wednesday’s practice and could return for Saturday’s game against Toronto. … Washington D John Carlson, born in nearby Natick, Massachusetts, celebrated his 29th birthday. … Boston announced a partnership with the Boston Pride of the National Women’s Hockey League team on Thursday. The Bruins are the fourth NHL franchise to partner with a NWHL team.